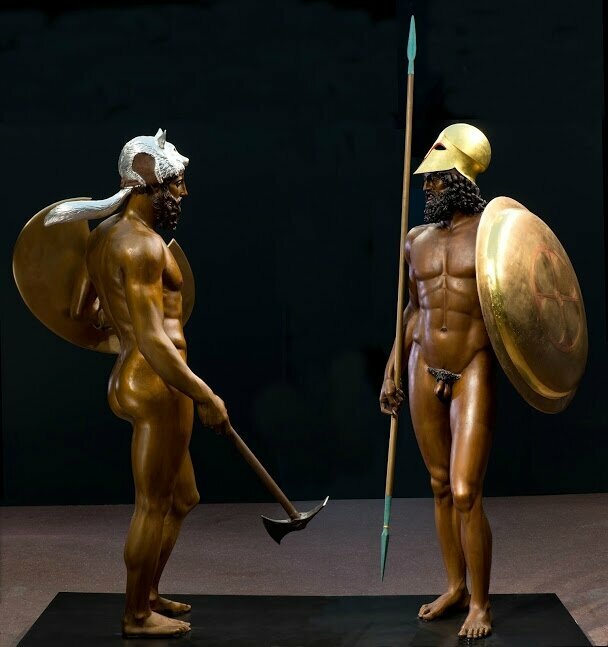 Reconstructions of the Riace Warriors (A and B), 2015-2016. 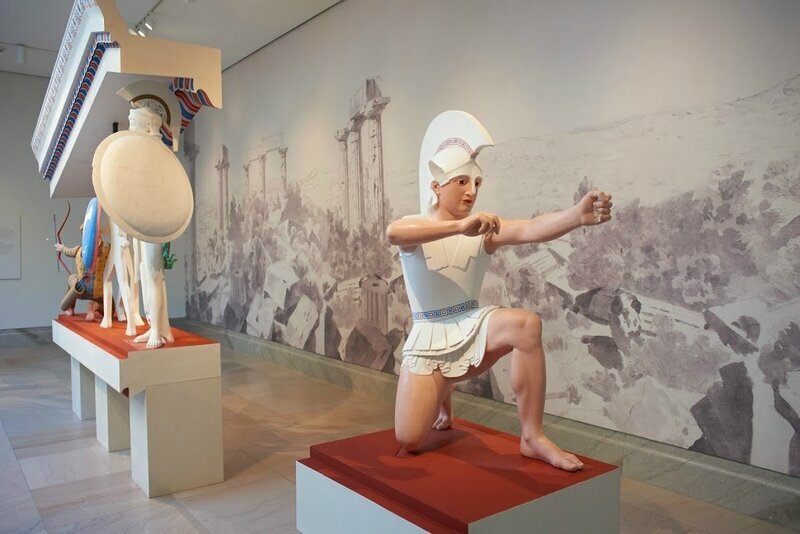 Copies of the original: National Archaeological Museum, Reggio di Calabria, ca. 460 BC. 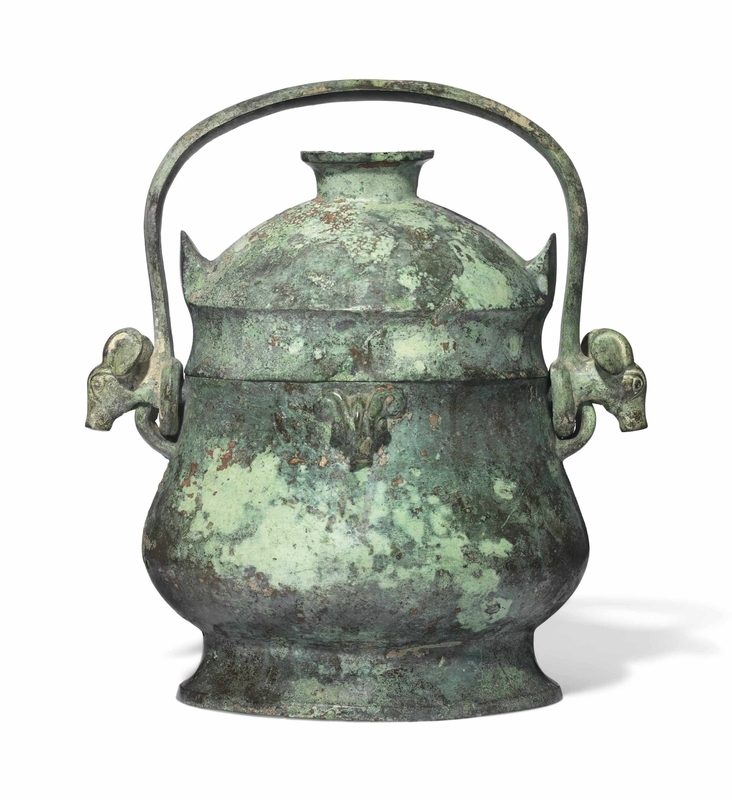 Bronze cast, copper, colored stones, silver, Japan lacquer. Liebieghaus Skulpturensammlung, Polychromy Research Project, Frankfurt am Main, acquired 2016 as gift from U. Koch-Brinkmann and V. Brinkmann. Image courtesy of the Fine Arts Museums of San Francisco. 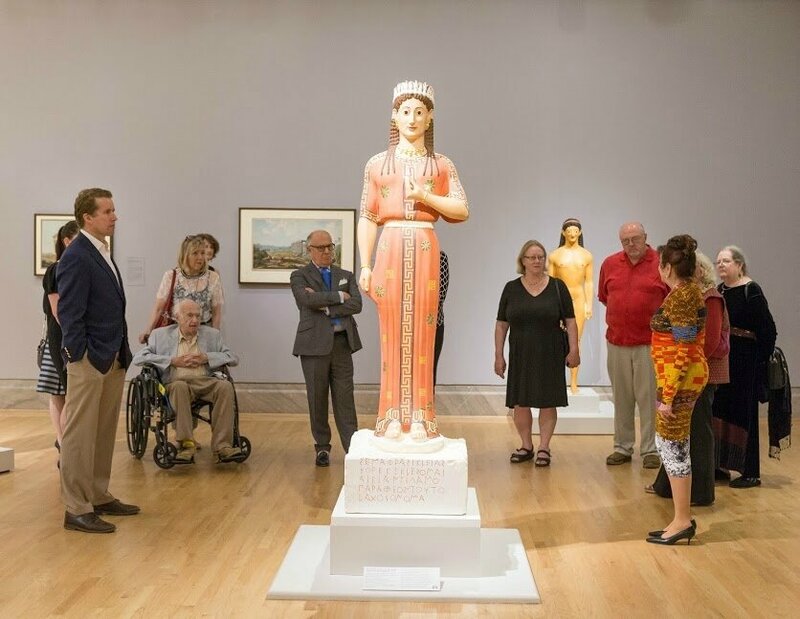 SAN FRANCISCO, CA.- The Fine Arts Museums of San Francisco is hosting Gods in Color: Polychromy in the Ancient World, an exhibition that presents ancient sculpture to Bay Area audiences as never before: in vibrant color. 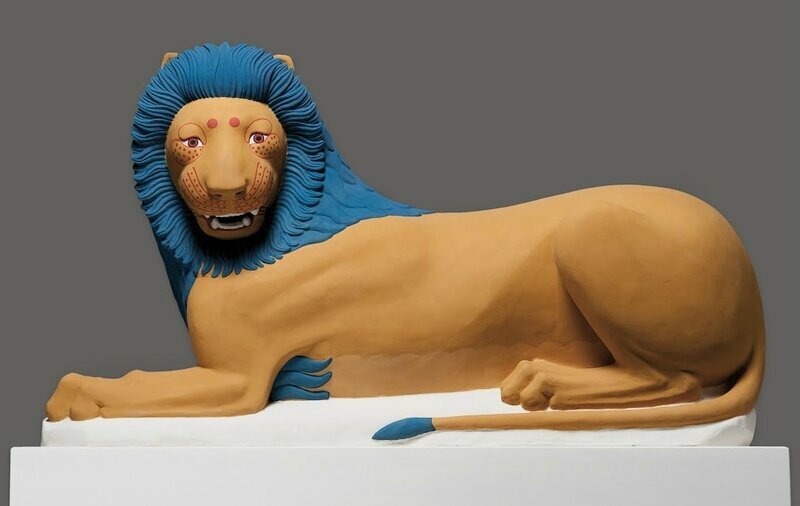 The exhibition reintroduces ‘polychromy’ – the painting of sculpture to dazzling and powerful effect. 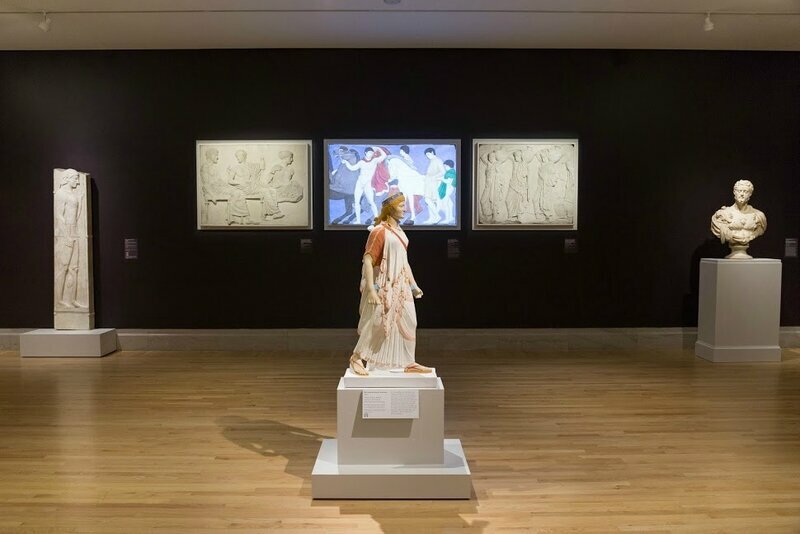 Defying the idea of the stark white marble of antiquity, the installation is the result of over 30 years of groundbreaking research in pigmentation of ancient sculpture by international scientists and archaeologists. On view at the Legion of Honor are nearly 40 reproductions of well-known Greek and Roman artworks painted in brightly colored authentic pigments, uniquely juxtaposed with 30 statues and carved reliefs from ancient Egypt, the Near East, Greece, and Rome from FAMSF’s’ own holdings, supplemented with magnificent loans from Californian and European collections. 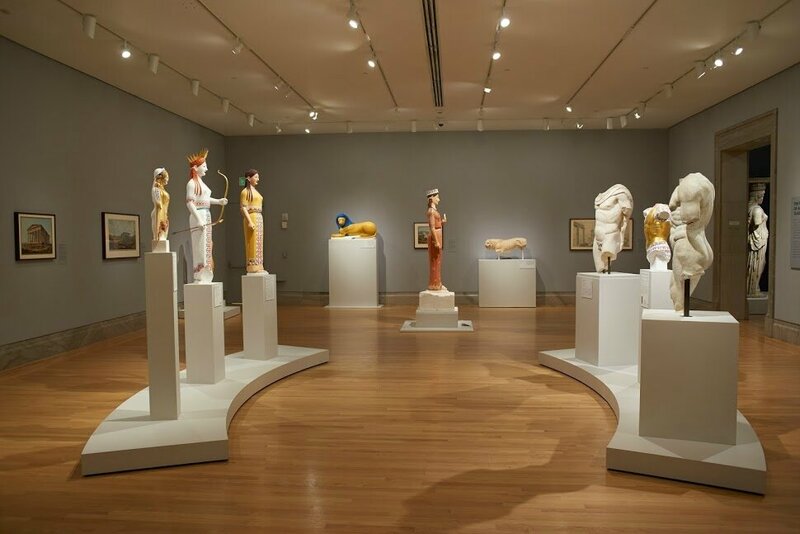 This exhibition not only challenges the widely accepted ideal of achromatic ancient sculpture, it also addresses how this misconception has influenced the history of sculpture. 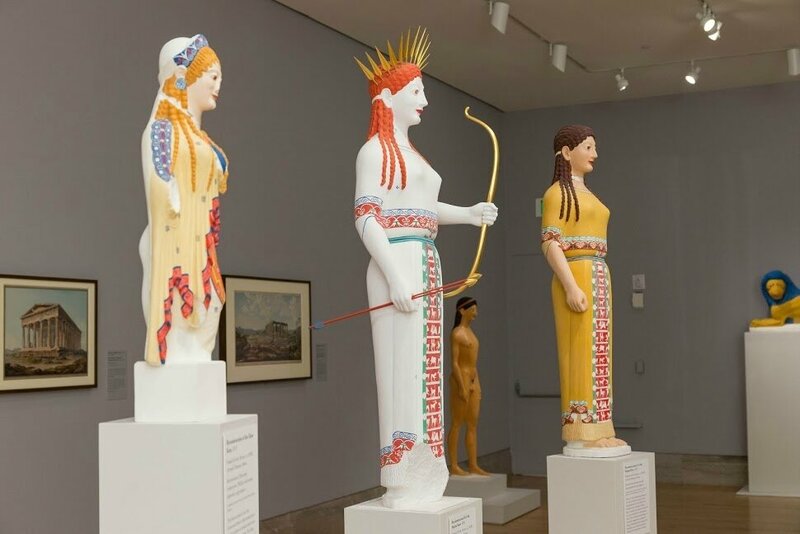 Works from ancient Greece and Rome also are joined by sculptures from Egypt and the Near East to reveal a fuller range of polychromy from across the ancient Mediterranean world. 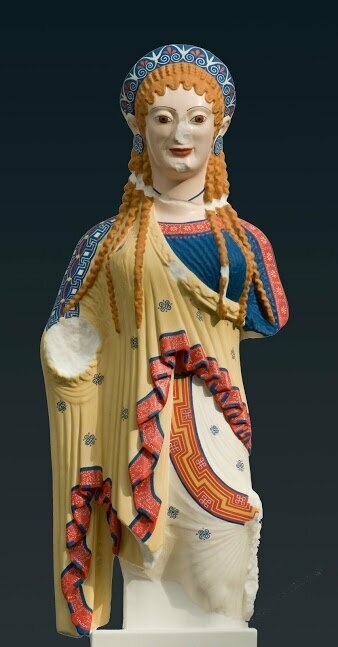 Gods in Color: Polychromy in the Ancient World is the result of decades of research by Prof. Dr. Vinzenz Brinkmann and Ulrike Koch-Brinkmann together with a group of archaeologists and natural scientists. Vinzenz Brinkmann is the original curator of the traveling Gods in Color exhibition and head of antiquities at the Liebieghaus Sculpture Collection in Frankfurt where he worked with Hollein during Hollein’s ten-year tenure as director of the Liebieghaus Sculpture Collection. 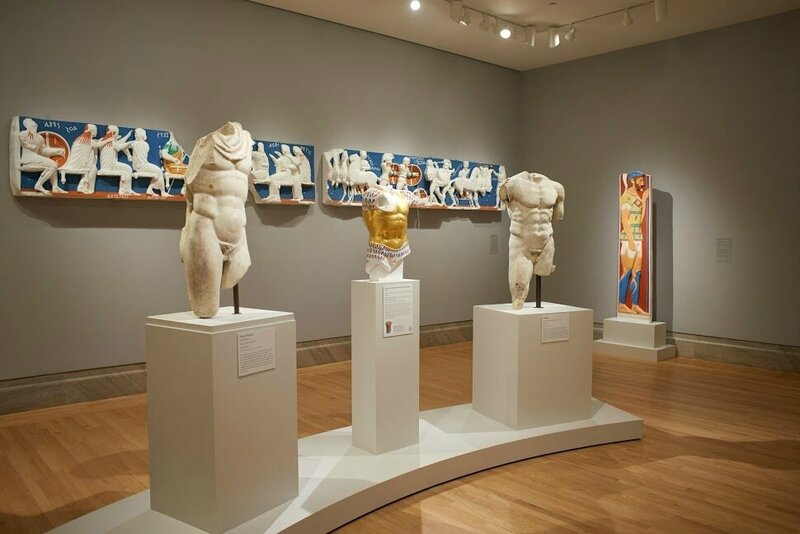 The exhibition has traveled to some of the leading museums in the world, including the Vatican Museums, Rome; National Archaeological Museum, Athens; Pergamonmuseum, Berlin; Kunsthistorisches Museum, Vienna; and most recently to the Museo del Palacio de Bellas Artes, Mexico City. 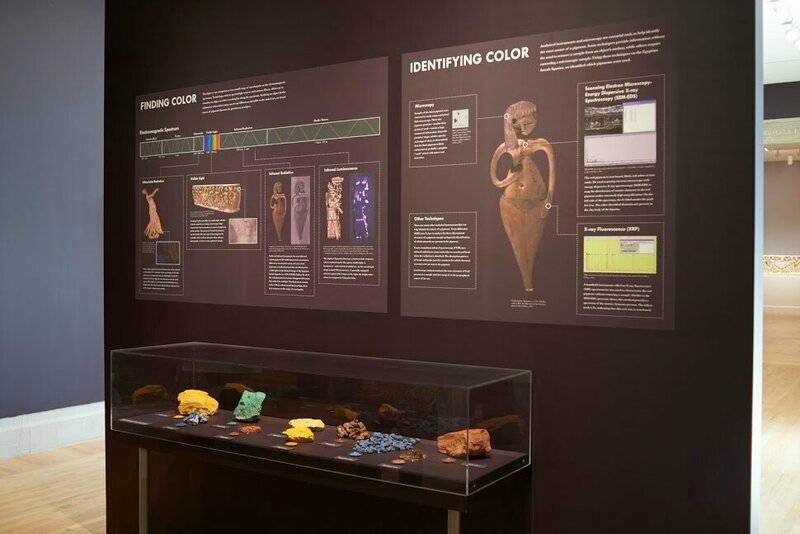 In San Francisco, it is being presented in its most recent version based on new research and reproductions. 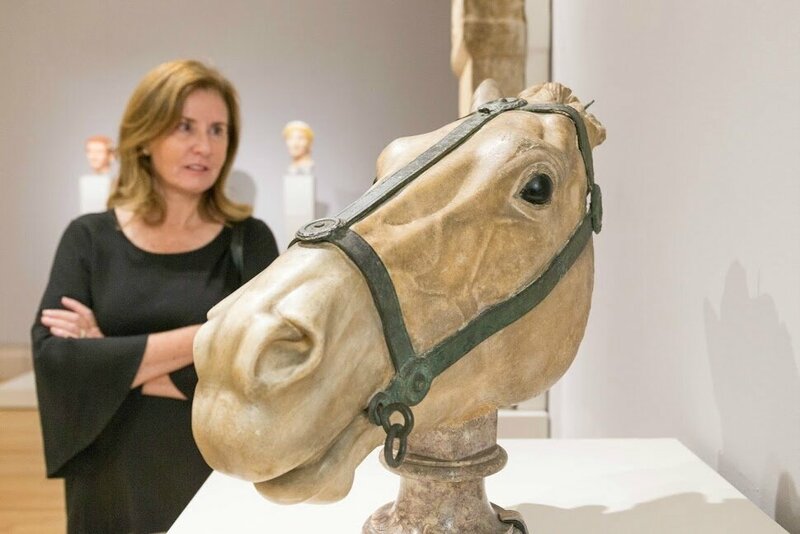 The exhibition is organized by the Fine Arts Museums of San Francisco in collaboration with the Liebieghaus Sculpture Collection, Frankfurt. 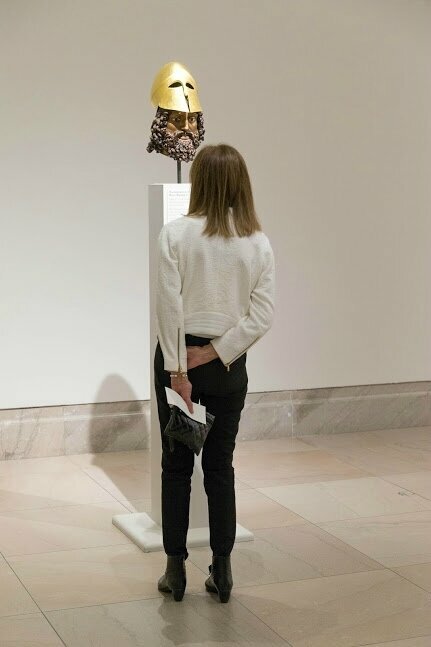 The curator of the exhibition is Dr. Renée Dreyfus, Curator in Charge of Ancient Art and Interpretation at the Fine Arts Museums of San Francisco in collaboration with Prof. Dr. Vinzenz Brinkmann for Liebieghaus Sculpture Collection. 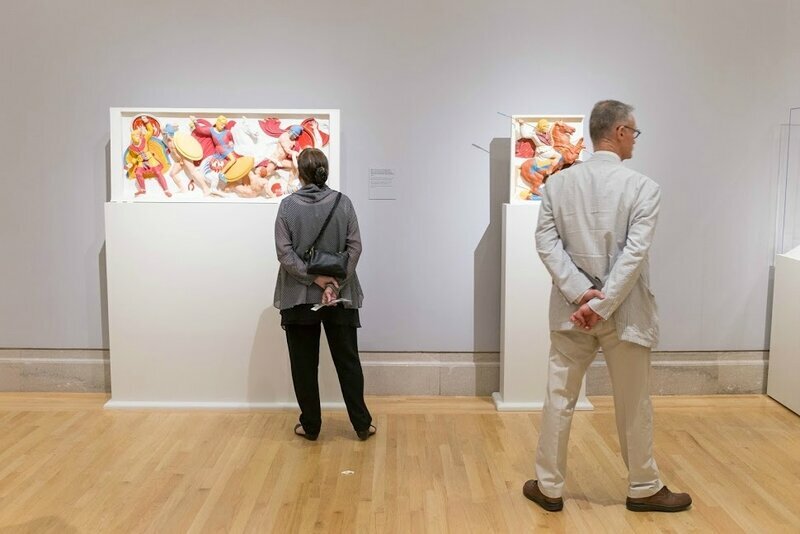 The exhibition is on view from October 28, 2017 – January 7, 2018. Reconstruction B of Athena, 2005. Original: Greek, Aegina, ca. 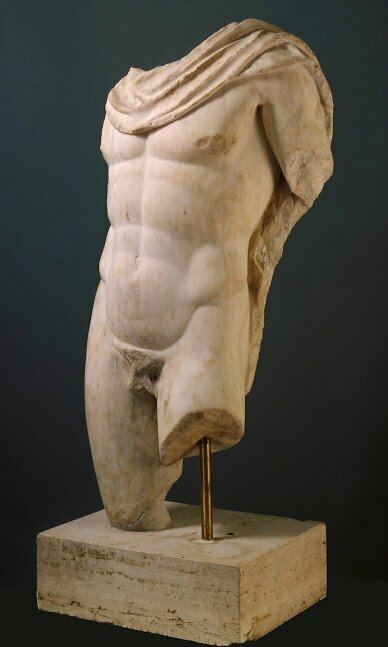 480 BC; Glyptothek Munich. Copy: Plaster cast with natural pigments in egg tempera, 67 in. (170 cm) height. Liebieghaus Sculpture Collection (Polychromy Research Project), Frankfurt, ST.P689A. Image courtesy of the Fine Arts Museums of San Francisco. Reconstruction of a lion, 2005/2012. Original: Greek, Loutraki, ca. 550 BC; Ny Carlsberg Glyptotek, Copenhagen. Reconstruction: plaster cast with natural pigments in egg tempera, 23 5/8 in. (60 cm) height. Liebieghaus Sculpture Collection (Polychromy Research Project), Frankfurt, inv. no. ST.P688. Image courtesy of the Fine Arts Museums of San Francisco. 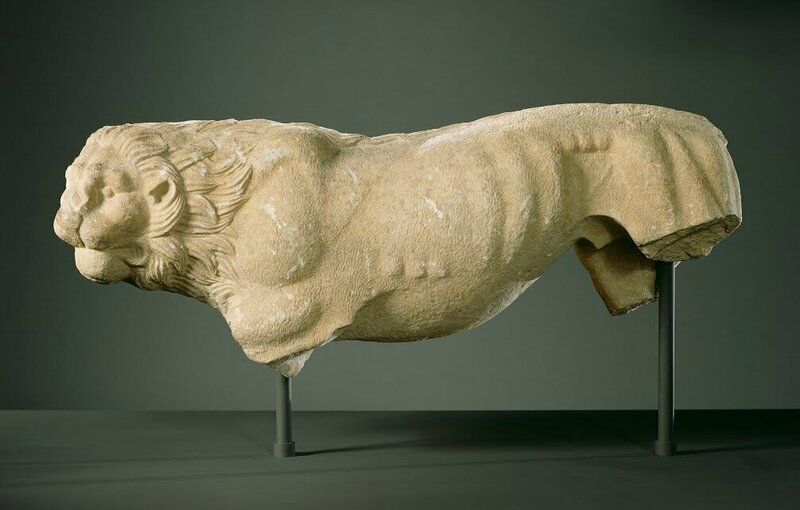 Statue of a Crouching Lion; Unknown; Greece (Attica); about 350 B.C. ; Marble; 36.7 × 20.3 × 92.1 cm (14 7/16 × 8 × 36 1/4 in. ); J. Paul Getty Museum. Image courtesy of the Fine Arts Museums of San Francisco. 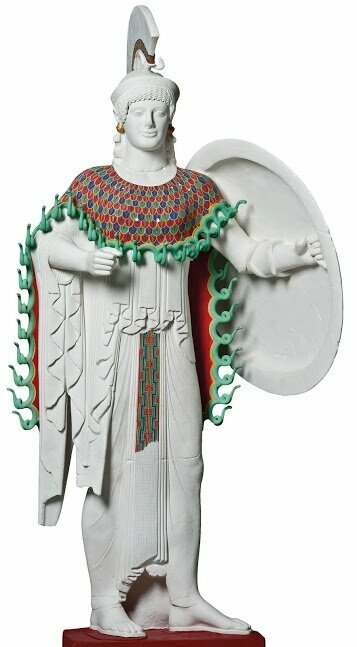 Reconstruction (A1) of the so-called Chios kore from the Akropolis in Athens, 2012. Copy of the original: Athens, ca. 500 BC. Crystalline acrylic glass, with applied pigments in tempera. 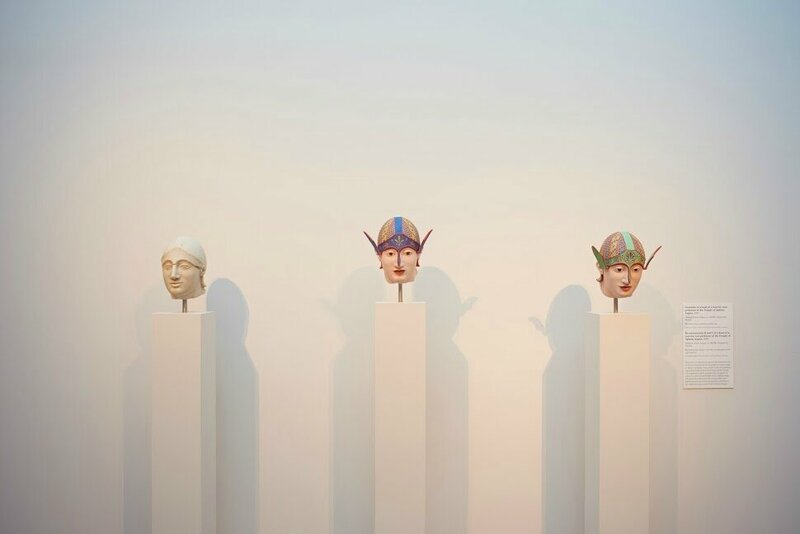 Liebieghaus Skulpturensammlung, Polychromy Research Project, Frankfurt am Main, acquired 2016 as gift from U. Koch-Brinkmann and V. Brinkmann. Image courtesy of the Fine Arts Museums of San Francisco. 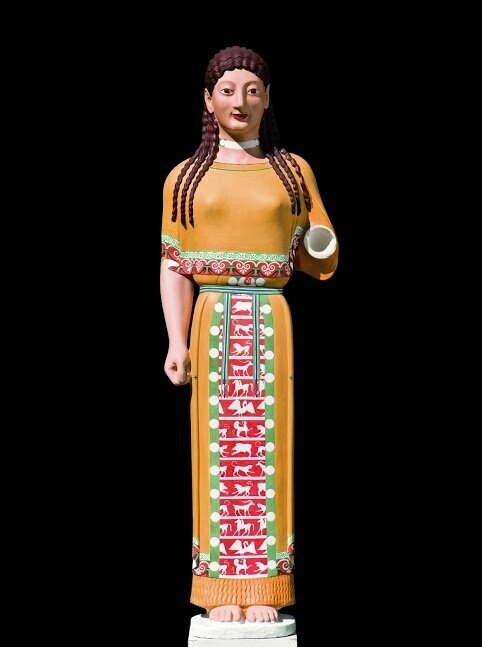 Reconstruction B of the Peplos Kore, 2005. Original: Greek, Athens, ca. 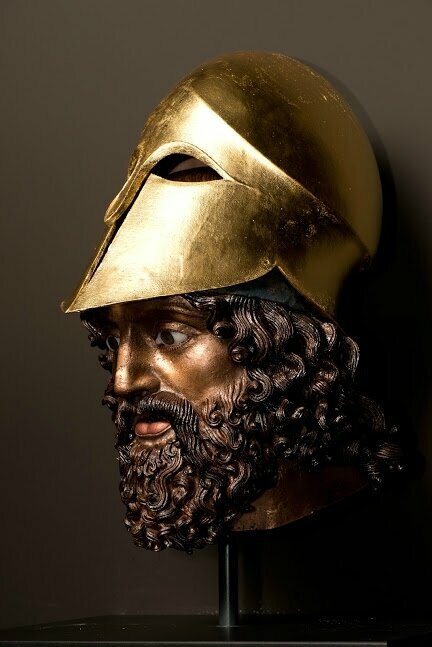 530 BC; New Acropolis Museum, Athens. Reconstruction: plaster cast with natural pigments in egg tempera, 53 1/2 in. (136 cm) height. Liebieghaus Sculpture Collection (Polychromy Research Project), Frankfurt, inv. no. ST.P687. Image courtesy of the Fine Arts Museums of San Francisco. 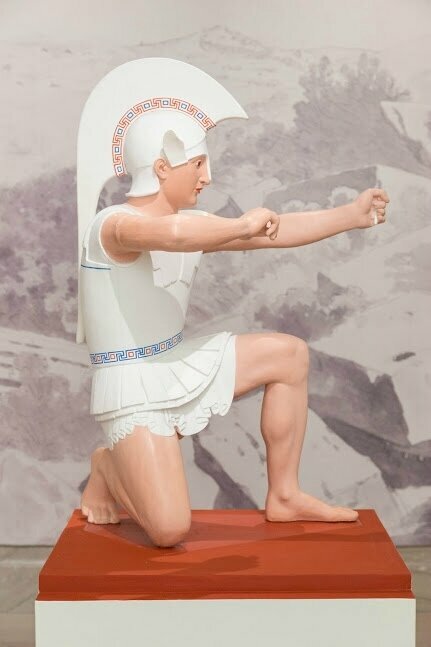 Reconstruction of the north frieze of the Siphnian Treasury at Delphi, 2016/2012. Copy of the original: Delphi, ca. 520 BC. Plaster caste, natural pigments in egg tempera. Liebieghaus Skulpturensammlung, Polychromy Research Project, Frankfurt am Main, acquired 2016 as gift from U. Koch-Brinkmann and V. Brinkmann. Image courtesy of the Fine Arts Museums of San Francisco. 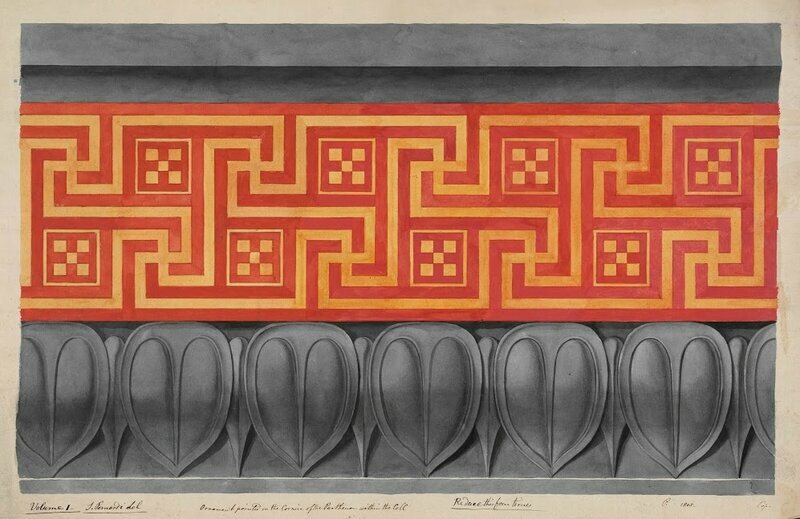 Simone Pomardi, "Painted ornament of the interior cornice of the cella," 1805. Watercolor. Inscribed by Edward Dodwell in pen and ink at bottom: “Volume I—S. Pomardi del” [underlined] / Ornament painted on the Cornice of the Parthenon within the Cell / “Reduce this four times” [underlined] p. 1805— / Cop.” The Packard Humanities Institute. Image courtesy of the Fine Arts Museums of San Francisco. Reconstruction of Theseus abducting Antiope from the pediment of the Temple of Apollo Daphnephoros, 2005. 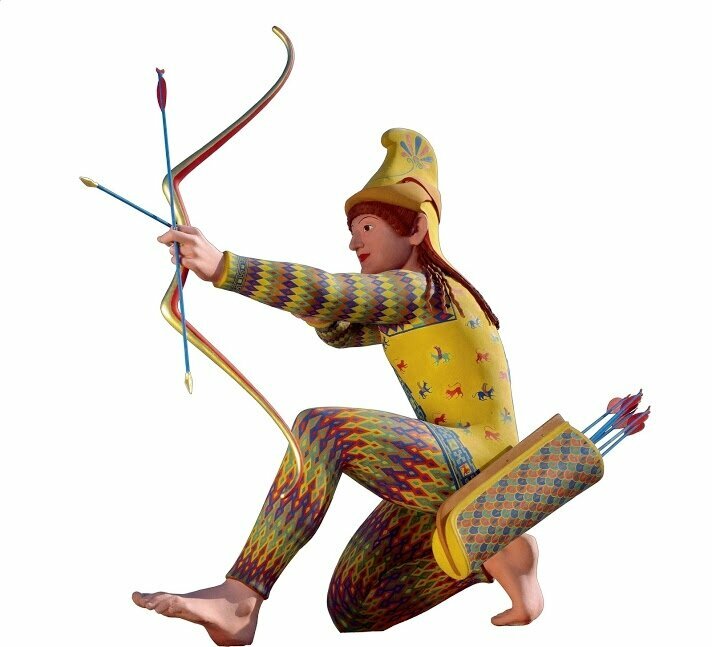 Copy of the original: Archaeological Museum, Eretria, ca 490 BC. Plaster cast, natural pigments in egg tempera. Liebieghaus Skulpturensammlung, Polychromy Research Project, Frankfurt am Main, acquired 2016 as gift from U. Koch-Brinkmann and V. Brinkmann. Image courtesy of the Fine Arts Museums of San Francisco. 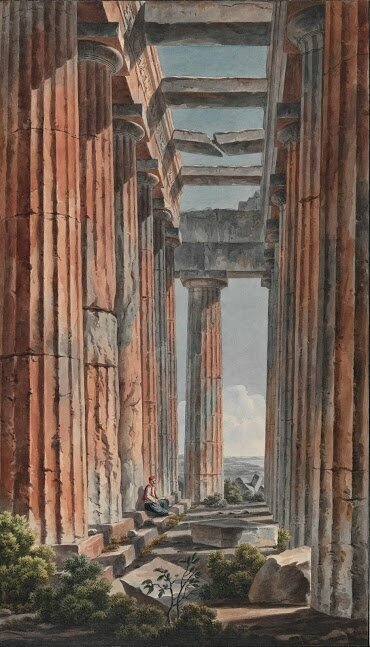 Edward Dodwell, "Parthenon, Western Pteron, Looking South," 1805. Watercolor. The Packard Humanities Institute. Image Courtesy of the Fine Arts Museums of San Francisco. 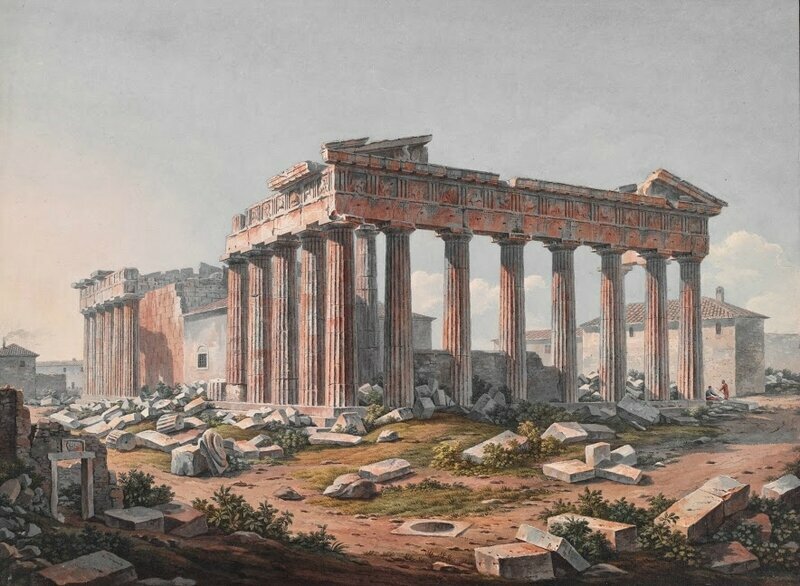 Edward Dodwell, "Parthenon from the Southeast," 1805. Watercolor. The Packard Humanities Institute. Image courtesy of the Fine Arts Museums of San Francisco. 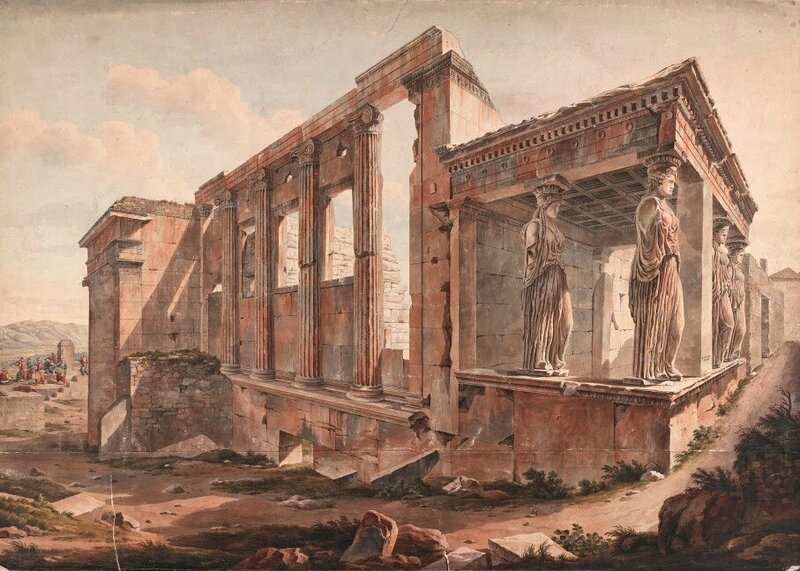 Simone Pomardi, "Western end of the Erechtheion from the Southwest," 1805. Watercolor. The Packard Humanities Institute. Image courtesy of the Fine Arts Museums of San Francisco. 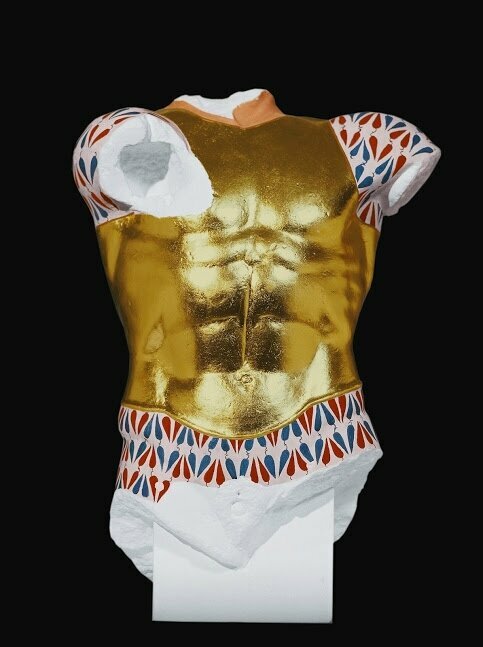 Torso of Hermes, After Polykleiots. Roman, 2nd century AD. 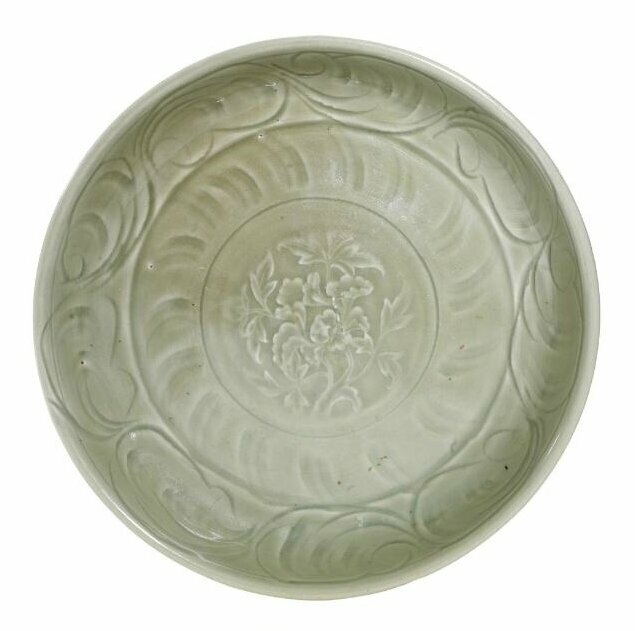 Pentelic marble. Fine Arts Museums of San Francisco, Gift of Vincent Price. Image courtesy of the Fine Arts Museums of San Francisco. 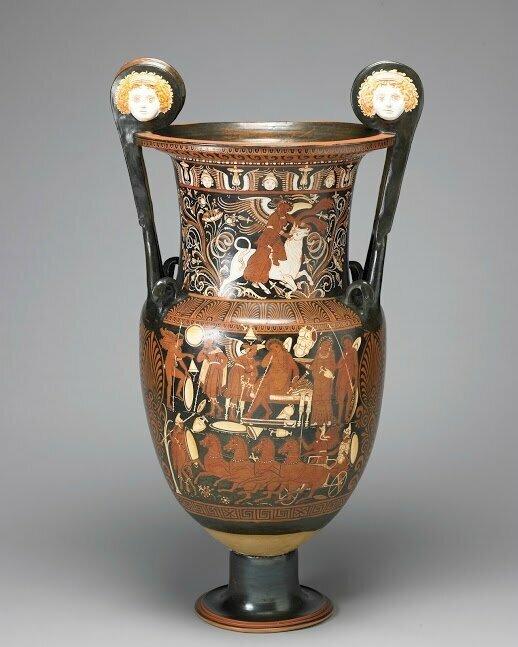 Red-figure volute krater, Southern Italian, Apulia, ca. 330–320 BC. Baltimore Painter. Terracotta. Side A: Mourning Achilles visited by the goddess Iris. Side B: Deceased hero sitting in a naiskos (small shrine). 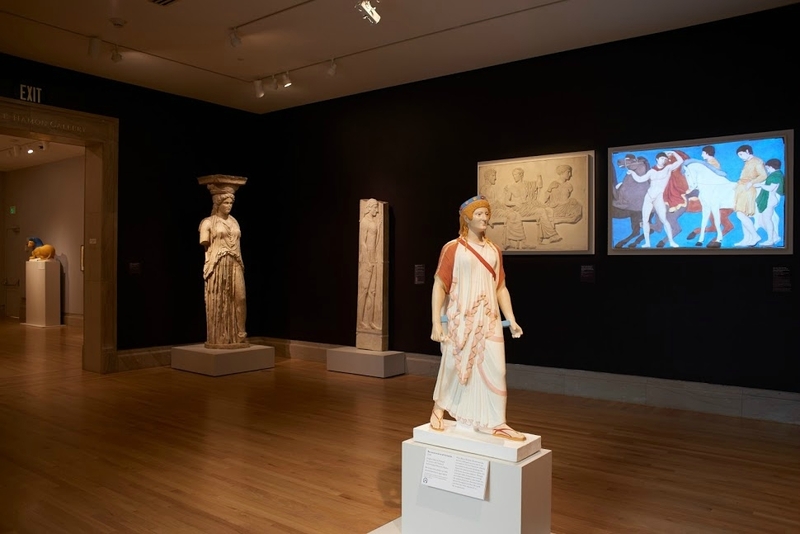 Fine Arts Museums of San Francisco, Museum purchase, Dorothy Spreckels Munn Fund. Image courtesy of the Fine Arts Museums of San Francisco. 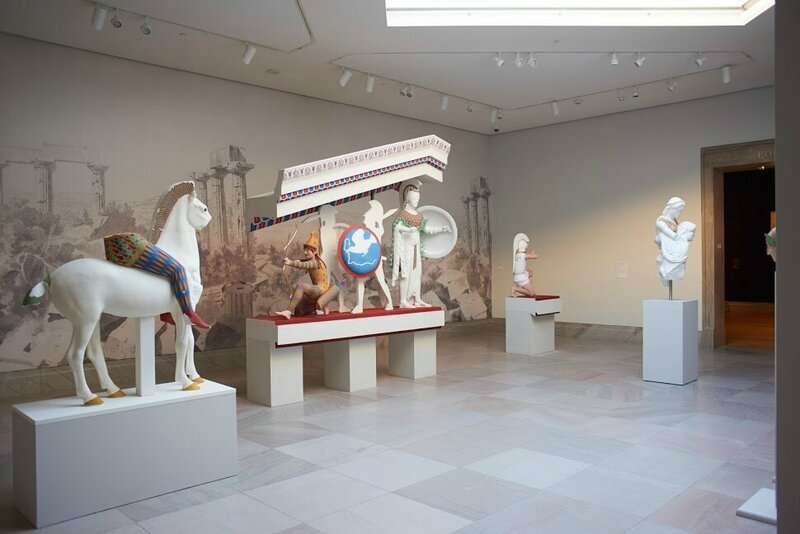 Installation view of "Gods in Color: Polychromy in the Ancient World" at the Legion of Honor. (Photo - Drew Altizer Photography). 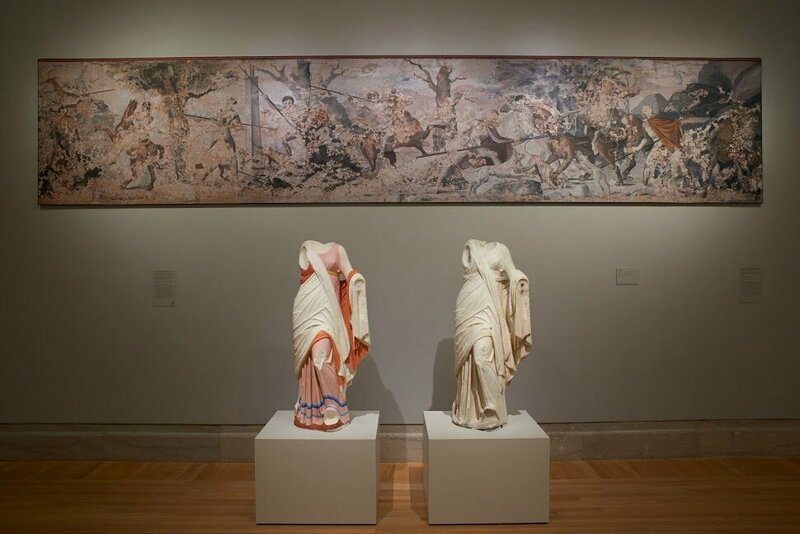 Image courtesy of the Fine Arts Museums of San Francisco. Statuette d'athena drapée en bronze doré. xviiie siècle.